We had said that the Delhi Twitterati have overwhelmingly endorsed stuff from BJP and Aam Aadmi Party sources. 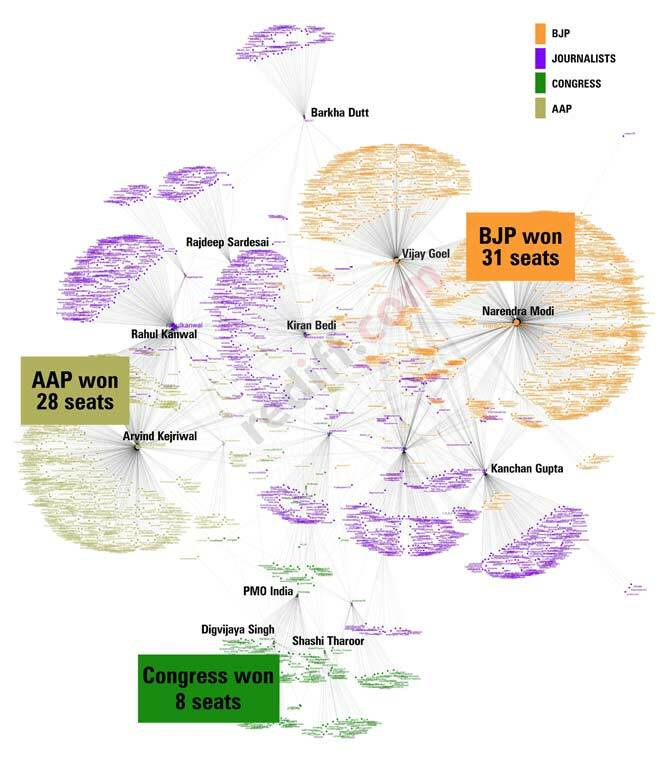 And the Delhi election outcome mimics the social media activities of parties. So the votes have been counted and the results are in for the Delhi assembly election. And the debutant Aam Aadmi Party has walked away with 28 assembly seats in a house of 70, denying the frontrunner BJP, with 31 seats, a clear majority to govern the capital, and leaving the Congress bruised and battered at a measly 8 seats. This outcome closely mirrors what our Delhi Elections Twitter Impact report -- in which we focused on re-tweets about topics that matter to Delhi-ites for the six days ending October 30, 2013 -- showed, that the Delhi Twitterati have overwhelmingly endorsed stuff from BJP and Aam Aadmi Party sources. Delhi cast its vote on December 4, 2013, with a whopping 66 percent of the electorate turning up to exercise their franchise, so much so that the Election Commission of India had to extend the official closing time till late in the evening. The AAP’s election campaign revolved heavily around the social media –both for reasons of practicality (the new party was short of funds to spend on expensive electioneering), as well as effective reach. Our intention in dipping a barometer into the social media world to gauge the political chatter surrounding the Delhi election was thus borne out by the final outcome on December 9. We looked at re-tweets because, we had said, a re-tweet is seen an endorsement. Our Twitter analysis showed that the re-tweets were heavily loaded in favour of the BJP and the AAP, and the election outcome mimics the social media activities of parties.